Only days after Baton Rouge Police Officer Matthew Gerald was buried, his three year-old daughter made a shocking announcement to his grieving widow – that Jesus said she had a baby boy in her tummy. 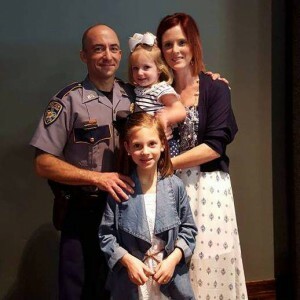 WAFB is reporting on the incredible story of Dechia Gerald whose 41 year-old husband was one of three officers slain during a July 17 ambush on police in Baton Rouge. Dechia said both her daughters – Dawclyn,9 and Fynleigh, 3 – were strangely aware of her pregnancy even before she knew it herself. A week later, just before attending a get together with family, she decided to buy a pregnancy test. She immediately told her family and friends, including the wives of the two officers who died alongside her husband. “For the most part, it’s a blessing. I mean obviously he left us a very special gift behind, but at the same time, all those days that I get overwhelmed, I ask how am I going to do this by myself without him,” Dechia said. But everything happens for a reason, she believes. “Did I ever think that we were going to have our time cut that short? No. Did I want to be a widow at 38 years old? No,” she said. Looking back on it now, she’s surprised that in the midst of 12 hour work days, she had time alone with her husband on July 12, the night she believes she conceived, which was just five days before he died in the line of duty. But she feels her husband’s presence all around her. For example, while driving to the doctor for her first ultrasound at four weeks, she heard their wedding song on the radio, something she had not heard in a while. She also noticed something that looks like a wedding ring in the first ultrasound image of the child. “I felt like when I saw that he was with us,” Dechia said. All she’s hoping for now is to one day hold a little carbon copy of her husband in her arms, completed with the blue eyes that she fell for seven years ago. “It’ll have the blue eyes. I’m sure the blonde hair although I’ve been praying for the red hair however I don’t know if that’ll happen,” Gerald said. Now 10 weeks pregnant, she believes God will guide her through life. “There’s no better gift that a husband could leave behind than a baby, a gift from God. There’s no better gift than that,” Gerald said. The baby is due April 7, 2017. This entry was posted on Tuesday, September 13th, 2016 at 4:04 pm	and is filed under News & Commentary. You can follow any responses to this entry through the RSS 2.0 feed. You can skip to the end and leave a response. Pinging is currently not allowed.